Melbourne's increasingly competitive apartment market has seen design emerge has one of the key differentiators for developers of smaller, boutique projects. 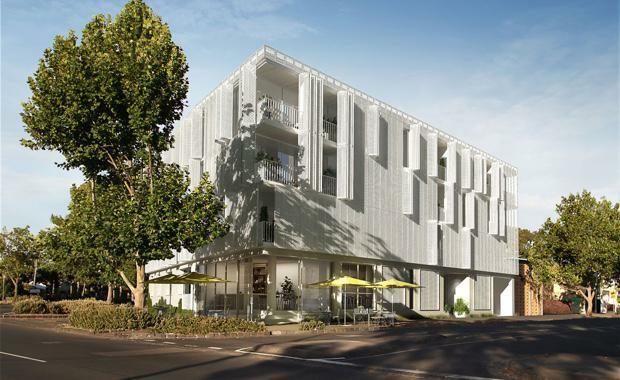 Milieu Property, one of the city's emerging developers, has put spatial design and innovation at the core of their new Nth FITZROY project. The former Carlton Motors garage site on York Street will house a four-level development with only 26 apartments, offering nine one-bedroom, 15 two-bedroom and two bespoke three-bedroom abodes. One-bedroom apartments, priced at $495,000-$595,000, are sized between 50-62 square metres; two-bedroom apartments, priced at $630,000-$860,000, are between 64-79 square metres and three-bedroom abodes at 117 square metres and priced at $1,295,000. Designed in collaboration with Fieldwork Architects along with Flack Studio, Nth FITZROY’s considered interiors and exterior spaces draw together through a veil of operable shutters, allowing the building to breathe and shed light with the rhythms of the day providing a seamless transition from day to night. The building is cloaked in a veil of operable shutters, which allows the occupants to fully control the light and transparency within each residence. A central open-air atrium with shared walkways, climbing greenery and lush leafy planting designed by landscapers MALA is designed to foster wellbeing and offers the opportunity for social exchange. This new project provides buyers a chance to secure one of the developer’s increasingly in-demand projects, which boast beautifully designed, aesthetic-focused owner-occupier apartments. Milieu Property Director Michael McCormack says, “This project allowed us to bring together some incredible Melbourne talents, who we’ve been excited to collaborate with as they understand and bring to life the distinct style and ethos that we’ve built in the Milieu brand. “Nth FITZROY are ‘breathable’ spaces to live in, recognising and reacting to the desire to come home to a sanctuary,” said Mr McCormack. Other features include 2.8 metre ceilings; natural light and ventilation to all bedrooms; abundant and clever storage and high-quality fixtures and fittings, including Smeg appliances and single car parks for one- and two-bedroom apartments, and two to the three-bedroom residences. Situated in one of Melbourne’s most highly sought locales, Nth FITZROY is right on the door step of one of the city’s fastest and highest capacity tram routes, 96 and 11; plus, purchasers will be close to prestigious Melbourne University and a short walk from Rathdowne Village, which boasts thriving cafes, restaurants and cultural hot spots. As part of the Nth FITZROY Display Gallery, Milieu has incorporated a brand-new hole-in-the-wall café, Saint George Coffee (@Saintgeorgecoffee), run by Katie McCormack, Michael’s twin sister. The petit corner-site is only a taste of what Saint George Café will be when they occupy the café and food store in Nth FITZROY. Sales for the project will launch in April with construction anticipated to commence in August 2016 and to be completed in early 2018.